on the Do Nothing bread of Yohan Ferrant. Autolyse 30 mins using 375g water and then sprinkled on the salt and mixed the starter into the remaining 75g water; in error the half tsp starter weighed 4g! Dough temp at this stage 26°C. 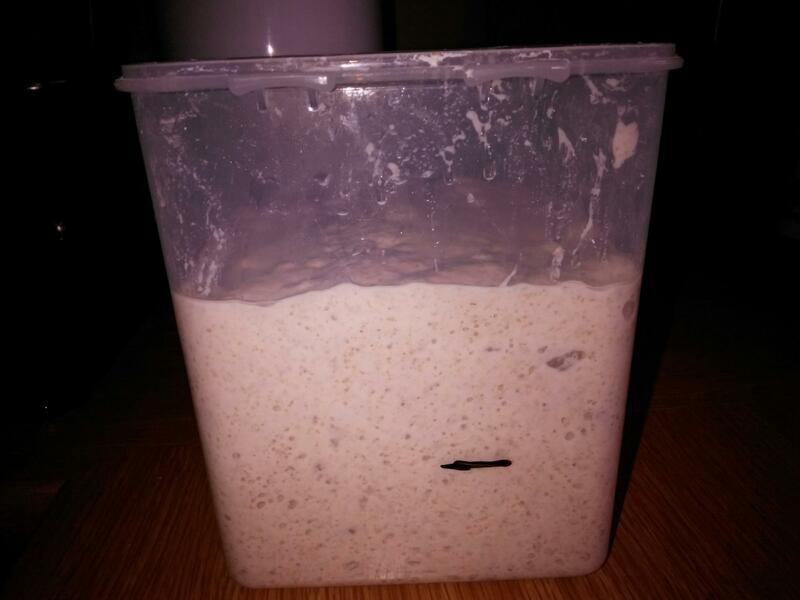 The dough went into the proofer set at 21°C. After 4 hours form mixing I did one set of stretch and folds. After 19 hours there were no signs of further expansion so I tipped the dough onto a floured board. The dough did not "pancake" but it was slack and I found it hard to shape to get it into the banneton and returned the dough to the proofer set at 21°C although using a thermometer the temperature was slightly higher at 23°C. After 2 hours the finger dent test showed a slow return but not complete so I judged the dough ready to bake in a DO in a preheated oven set at 240°C. After 15 mins I removed the lid of the DO and continued baking for a further 15 mins before removing the loaf from the DO completely and placing the loaf directly on the oven shelf for a further 10 mins. Internal temp of loaf 98.4°C. So not the tallest loaf but tasty, and not too strong a tang. I intend to repeat this in a few weeks' time but using a long fridge retardation to see how that might affect the outcome. 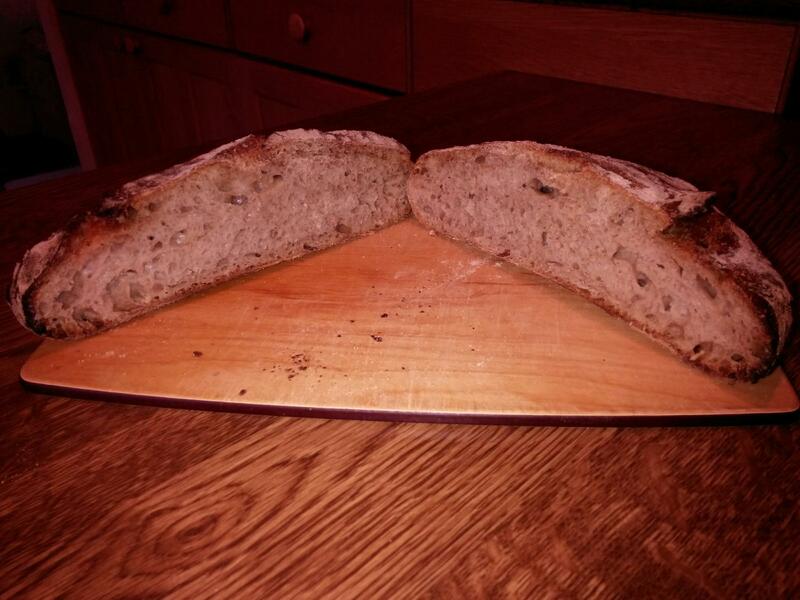 I just made my first successful loaf last night after two initial failures. My first two loafs came out flat like pancakes. 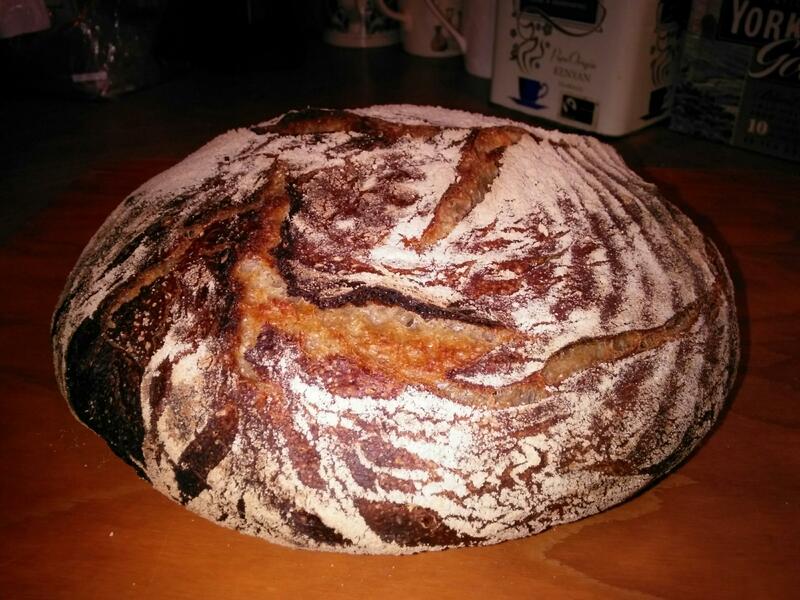 I also had hard time shaping the dough to a boule. I found doing more stretch and fold during the bulk fermentation will help to build the structure of the dough and will help it from flatten. When making my third loaf, I stretched and folded the dough 4 times after I mixed the dough and then I put it in the fridge. I did another 2 in the middle to make sure it still had the strength. I feel it helped a lot with the structure and my loaf came out nicely. Hope it will help. I too would normally do a series of stretch and folds during the bulk ferment. However this bake was an attempt to follow the Do Nothing bread by Yohan Ferrant and widely available as a two part video. However I have yet to find a complete set of instructions for the bake and have supplemented what I gleaned from the videos with the content of a Teresa L Greenway video "Another Take...". She says " allow the dough to set undisturbed for 24+/- hours at room temp, folding one time during that period." I assumed that by folding she meant a set of 4 - 8 folds and I opted for 5. It may well be that I do not have the necessary skills to achieve a good outcome with this method but I will return to it at a future date. doubled - closer to triple since your bucket isn't straight sided - shoot no more that double instead, The loaf was also over proofed a bit but not horribly so. The finger poke test does not work at all well - when it says bake it is already over proofed. Use volume instead For a 20% whole grin bead let it proof to about 87-88% and then in the oven it goes. It is hard to judge volume in a benneton since they don't have flat bottoms and straight sides. Next time make some extra dough and put it into a straight sided glass the same time the dough goers in the basket so you can easily see what 88% proof looks like in the glass and compare it to your benneton at the same time. You will quickly see ow over proofed it is. 90% hydration for a 20% whole grain bread will spread no matter what you do though, especially a do nothing bread where the gluten isn't developed as well as it could be, but the right ferment and proof will help a bit for overall height. I sense that you are right about the over proofing. However I do believe that the pic that I posted exaggerates what I thought were vertical sides. I took the pic from slightly above the tub in order to include the surface to demonstrate both the bubbles throughout the dough and the larger "blister" bubbles on the surface. I have now measured the tub and it is very slightly larger at the top than the bottom (possibly to facilitate stacking?). The actual height was 2.1x the original so perhaps the volume was up 2.25x? I do feel that I am not good at judging when the dough is ready and I am not at all confident with the finger dent test (more practice required?). Using a banneton is not very helpful for the reasons you describe. I was hoping to find that the dough after the bulk ferment was as easy to handle as Ferrant made it look in his masterclass! As I understand it he used all T65 white flour plus some seeds in his bake so I hoped that 20% whole grain would have helped me. Thank you for responding with your constructive comment and suggestions.